I was rushed and frankly did not prepare enough for an explanation of eXtension. This post is my attempt to explain eXtension and share openly some of the discussion. I am trying to become better at “working outloud” as Harold Jarche drove home the point in the panel discussion at National eXtension Conference. I start most of my presentations with questions to the people in the room. The answer to the first question, “What is Cooperative Extension’s best resource?” is always “its people”. I have never heard anything different. The reason I asked this question is that it is people who build relationships. It is those relationships should be made and maintained online—just as we expect Extension professional to establish relationships in their physical meetings. The second question was: “What makes Cooperative Extension the best choice—the optimal choice—possibly the only choice for its mission?” One lady answered it is the people and diversity of expertise Extension has (apologies to the engaging lady for my severe shortening her response. The other response was that Extension provides research-based information. By all means Cooperative Extension needs to continue to provide research-based information, but Cooperative Extension is not the only organization or individuals who are doing that. Citizens provide research-based information as well as other universities. We are all aware of that there are many people and organizations that share information that is not grounded in research. We also have to remember that research can sometimes provide mixed, conflicting, and undecipherable information. There is growing evidence that the trust of universities is waning. People do trust other people who are in their friend and colleague circles. Online book, Trust in Universities, written by academics address several issues with trust in universities. At one time, everyone knew the Extension agents. Extension agents were seen as responsive. They not only provided home & farm visits, but they included farmers and others in research. The local Extension agent was known as the link to the land grant universities. They were the connection to the most recent research and they were the ones who introduced young people in the community to higher education and land grant institutions. Extension agents were a part of the elite group in the community with college degrees. In 1993, Dave King wrote a Journal of Extension article about Cooperative Extension’s image deficit. We also know from the 2009 Copernicus study that the younger the generation is less likely to know of Cooperative Extension or will have ever used Cooperative Extension. Though the study concentrated on the branding issues and not making the link from our flagship programs—4-H and Master Gardeners—I also believe that we are not reaching enough people. The study also showed that for those people who have used Cooperative Extension they thought Cooperative Extension provided value. Who has heard of and used Cooperative Extension? We can’t talk about changes in last few decades without talking about the significance of Tim Berners-Lee proposal in 1989 that created what we now know as the Web. Berners-Lee released the code for free for an “information management” system. We not only owe Berners-Lee for his foresight in technology but also his vision and continued voice in understanding the depth and breadth of the advantage of that the “free code” and campaigning for Net Neutrality. John Hartley, a student in the class, referred to some opinions that mobile devices are killing the idea of hyperlinks because data are sitting in silos and not including hyperlinking—the foundational concept of the Web. The social online abilities are obvious changes as well. Skills for Cooperative Extension Professionals. We briefly talked about the six drivers of change that the Institute of the Future describes in their report on the work skills needed for future knowledge workers. The drivers are: rise of smart machines and systems, globally connected world, superstructed organizations, new media ecology, computational world, and extreme longevity. 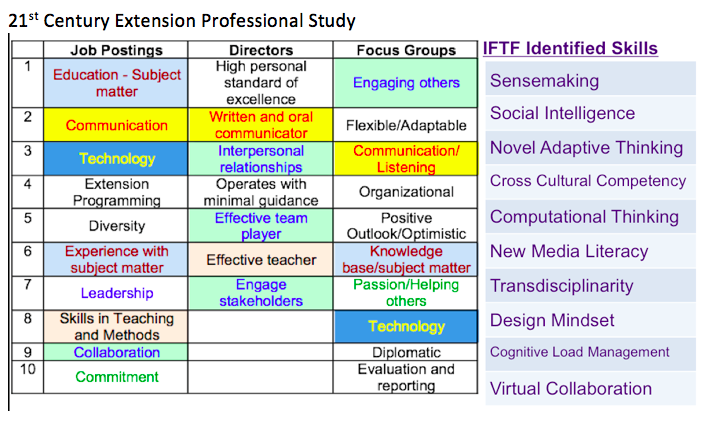 In this report, IFTF describes 10 skills needed for the future. We also talked about the Extension Committee on Organization & Policy (ECOP) sponsored a study on the skills needed for the 21st Century Extension professional. Skills from both of these studies are shown in this table. Build new relationships and maintain traditional relationships online. We cannot scale ourselves by with our current face-to-face relationships. Also there are many potential clientele who simply do not have a desire to drive to the county office or attend a physical meeting. Even some of our current clientele are asking for more flexibility in learning opportunities. Learn informally through information flow and others online. Cooperative Extension professionals are the epitome of knowledge workers. Extension, like many organizations, does not have the capacity to provide all training and knowledge to its professionals. Cooperative Extension professionals should have the desire and flexibility to learn informally from others through online networks. Using the relationships with others to filter and focus on pertinent information. Cooperative Extension has tried to provide services and employment by seeking demographic diversity. We also need to be more cognitive of seeking out clientele and others who have different political ideals, social beliefs, disciplines, and culture. Diversity of thought provides opportunities for innovation and improvement our reach and impact of our programs. Integrate research and extension beyond what we currently do. Know that we are not the only experts and that complex problems cannot be solved and forced (i.e., through logic models). The Cynefin framework describes how solutions for complex problems derive different results and cannot fit into neat model. Rather that complex problems should be address in a probe, sense, and respond. Extension has traditional been very good curators, putting information into context and meaningful descriptions. To increase our reach and impact, we should provide our knowledge and curate online in open and transparent forums. A few of my own thoughts on the attributes are a successful future for ExtensionTransparency and openness in our work, decisions, and findings. All Cooperative Extension materials were public domain before 1990. Creating and scaling our work cannot be done easily through all rights reserved products (Creative Commons licenses that allow for easy sharing and remixing). Inclusion of people outside of Extension, particularly passionate amateurs in our work this allows for scaling our work without growing our organizations. Ability to test (and fail) more easily to acquire more agility and innovativeness. There is no federal or centralized system for Cooperative Extension. Cooperative Extension obviously has federal ties with USDA, ECOP and Association of Public Land-grant Universities. eXtension provides opportunity to find synergies across state lines with a national online presence. eXtension is more than a web site—it’s a presence, it’s professional development, and it’s a mechanism to breakout of our geographic buckets. eXtension is currently funded through New Technologies of Ag Extension (NTAE) and assessments from the Cooperative Extension institutions. CoPs sometimes include others outside of Cooperative Extension. www.extension.org is the hub for eXtension. Ask an Expert https://ask.extension.org/ is an opportunity for anyone to ask questions on through widgets. These widgets can be installed on any web site. AaE provides one-to-one engagement prospects that are analogous to telephone calls that come into county offices. People ask questions through Ask an Expert widgets and Cooperative Extension/University staff and volunteers answer them. AaE widgets can be customized for area of interests—generally around the CoP topics or locale. Many county offices use the widgets and direct the questions to their own staff. Questions can be distributed throughout the Cooperative Extension system, in other words the system has the “local offices’ back”. A public option is available for the questions so the questions can be searched and commented on increasing the opportunities for discoverability and engagement. Reports are available by state and individual. This feature is helpful for end of year reporting for Extension professionals. There were 48,000 questions last year answered through AaE. 54% of the people asking questions had never heard of Cooperative Extension. 44% of the people described that their questions had some or significant economic value. Texas answered the most questions. Many questions come from metropolitan areas, like Houston (Harris County). Learn https://learn.extension.org/ is a listing of synchronous online professional development and other learning opportunities. Events listed maybe hosted by eXtension, others in Cooperative Extension and other entities. Anyone can post events in Learn with Google, Twitter, Facebook or eXtension IDs. Each page for each learn event can serve as holding place for everything related to the event. Those posting the events can include descriptions, time, dates, connection information, slidesets, additional reading material and recording links. Those interested in the events can add them to their calendar, follow the event for changes, and comment on the events by logging in with Google, Twitter, Facebook or eXtension IDs. Those who “follow” events can see are listing of all the events they participated and presented. There were 494 webinars listed in Learn in 2013. Campus http://campus.extension.org/ is an asynchronous integrated online learning platform using Moodle. Campus provides course delivery tools and services that can uniquely combine web pages, videos, books, lessons, assignments, forums, chat, certificates, databases, glossaries, quizzes, journals, and questionnaires into personalized learning environments. Courses can have closed or open enrollments. Courses can be fee-based or free. The CoPs issued almost 15,000 certificates in 2013 and had 21,000 active users. There are more than 573 courses in Campus. Create http://create.extension.org/ is the main place where the CoPs collaborate. Create is also used an internal work space. When articles are written collaboratively in Create, reviewed by peers, and copy edited they are then published to published to www.extension.org where the content is indexed in search engines. Though anyone can see the content in Create, one must have an eXtension ID and belong to the community to edit anything in Create. People https://people.extension.org/ is where one obtains an eXtension ID, creates a profile, list social networks and interests, and indicates profile settings for Ask an Expert, Create, Learn, and Data. People serves a springboard for any work that requires an eXtension ID. People is great way to find communities and colleagues . What are the forces important for Extension and land-grants to adjust to? What should Extension focus on that will make us successful in the future? How do those focus areas affect our work force? So much here, Anne. It would be fun to deconstruct this and discuss items in a workshop someday. I appreciate your focus on trust and building relationships and how trust in universities is not once what it may have been. I think building trust and relationship building is just as needed internally within our national system. I see we often skip over this because we are seen as a system or one organization, but building trust with each other IMHO is foundational to reaching beyond. I would argue there are many times we could be working together but different groups may seem like they have a rift between them just because they don't know each other better (because of job classification, different program area, or geography). On the positive side, I've seen these 'rifts' quite readily disappear when we just spend time connecting, conversing or making conversation. Because our new social networks let us interface with with both internal/external 'audiences' simultaneous, it's great to think that we could build trust and relationships simultaneously just by sharing or narrating or work )http://www.jarche.com/2012/01/narration-of-work/ just a few minutes (or a bit more) per day. Nice post Anne! Thank you! Anne's Spot by Anne Mims Adrian is licensed under a Creative Commons Attribution 3.0 Unported License.